Fall is definitely in the air, and the leaves are slowly starting to change colors. I love this time of year. 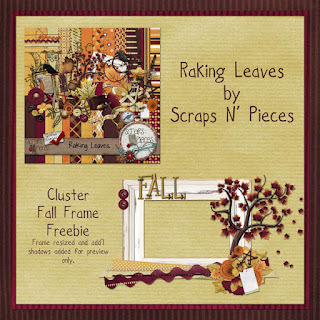 Scraps N' Pieces has created a kit to get you in the mood for Fall. You will love its warm rich colors. You can get this kit at Scraps-N-Pieces and My Memories for the first week for $3.00. Here is a look at the full kit. Image is linked to SNP. Preview of the Papers. Image is linked to My Memories. Here is a look at what their CT did with the kit. Meagan’s Creations has created another beautiful WA pack that coordinates with the kit. You can grab it a SNP for 1/2 off the first week also. Here is a look at it. Image is linked to SNP. I've also created a freebie for you - click here or image to download! Thank you so much for this post. I want to let you know that I posted a link to your blog in CBB Digital Scrapbooking Freebies, under the Page 4 post on Sep. 25, 2012. Thanks again.